I was trying to categorize these as gluten free pizza bites, but it turns out there’s a huge discussion on whether gorgonzola cheese is in fact gluten free or not. I don’t wanna go around that mess. I don’t have any gluten sensitivity, so I ate a lot of those. 6 on day two of my current mission to be exact. They’re good as a snack, but also in a combination with a salad as lunch or dinner. You can just put them in your Tupperware and take them anywhere with you – to work, to the mountain, to the beach, to the library, to McDonalds, in the car…Just anywhere. I must admit they smell a little like garlic, but hey, name one good thing that doesn’t. They’re amazing when they’re hot and fresh out of the oven, but do as well when cold, in case you don’t have access to a kitchen (or at least to a microwave). 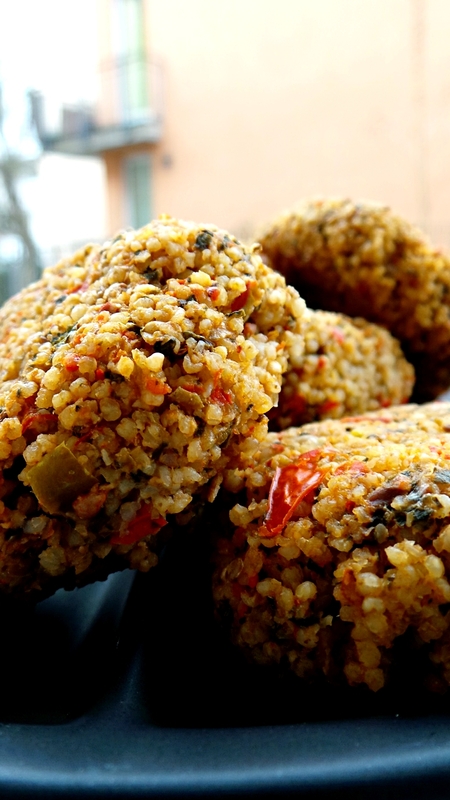 So to make these you’ll need millet. Ahhh yes. The lobster of bird food. Underestimated and overseen by many. The better version of couscous – it’s not expensive, is gluten free, rich in iron, zinc, niacin and folate with a sweet nutty flavor. It’s perfect for breakfast, salads and these pizza balls. I don’t have any more of these pizza balls, so to not bite myself anymore I’m going to my pilates class. Hopefully it will be only stretching. Cook millet according to the instructions on the package. Blend tomatoes, capers, garlic and basil in a food processor. Add flax egg /or egg, red pepper, spinach, hot pepper powder, olives and blend again. At last add millet and blend everything together. The millet seeds should still be whole. Form small patties or balls. Add the cheese cubes in the middle of the small burgers/balls. Cover a baking tray with baking paper, so you don't make a mess and don't wash too much. Then place each ball on the tray and bake at 220°C (or whichever way you bake pizza) for around 20-30 minutes. Depending on your oven you might need more or less. Just check after 20 min. The bites should look golden-brown. Are you ready? Serve with a salad of your choice or make a dipping sauce you like. For me it was avocado salad or avocado dipping sauce with tomatoes, arugula and some basil.